This page is about synthesizing a LoRa signal such that it can be "played" back using a software-defined-radio with transmit-capabilities. This should help further in understanding the structure of the LoRa modulation, see also my other page DecodingLora. The desired end result is that the transmitted LoRa signal is compatible with and can be received with existing LoRa hardware. we're creating a stereo WAV-file that represents the I and Q components of the complex baseband radio signal. initially the focus is on just generating a "LoRa-like" signal, consisting of a valid preamble (with sync pattern) but with pseudo-random data after the header. This should be good enough to be used as an interference signal in studies about the robustness against interference from other LoRa devices. I'm planning this as a signal processing chain consisting of several blocks in series, very much how GnuRadio works. I'll probably be writing this in C or Java because these are the languages I'm most familiar with. Maybe later I can port this to the GnuRadio framework. I forgot about the 1/4th symbol at the end of the preamble, I'll add that and clarify some names in the source code. implement DE parameter (if enabled, difference in shifts between symbols is bigger, making it more robust but a bit slower). do more research on the channel coding, make it work for a very simple set of parameters, e.g. SF=10,DE=1,CR=4/8, which means 8bits/symbol, or 2 symbols per input byte. How I plan to generate to synthesize the signal, is as an over-sampled sweep, offset in base-band frequency so that it does not sweep through or near 0 Hz. This should make it easier to deal with DC offset problems and mirror images when it is finally up-converted from base-band to RF in the SDR. I plan to choose the sampling frequency as some nice integer multiple of the bandwidth (power-of-two even). It creates a raw data file with a preamble consisting of 8 unmodulated symbols, a sync word, two reverse chirps followed by 16 symbols of random data. The I and Q samples are encoded as signed 8-bit words and interleaved (even = I, odd = Q). The example code uses a BW parameter of 125 kHz, the sample rate is chosen exactly 8 times higher at 1 MHz. The signal frequency is offset so it is centered around Fs/4, or 250 kHz. 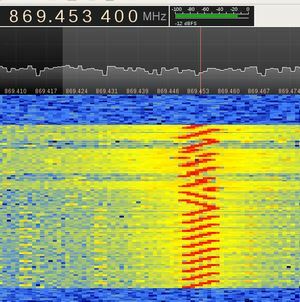 When transmitting the signal through an SDR, the SDR mixer frequency should therefore be tuned 250 kHz lower than the desired LoRa center frequency. 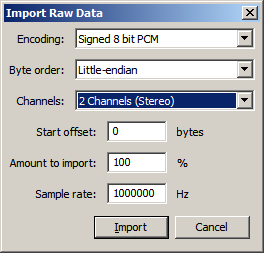 You can read this into Audacity (using it as a poor man's signal analyzer), by importing the signal in raw format and using the settings as shown on the right. There are two identically looking signals in the spectrogram view, these are the I and Q signals, but you cannot really see any difference between them in this view. This page was last modified on 31 May 2016, at 14:38.